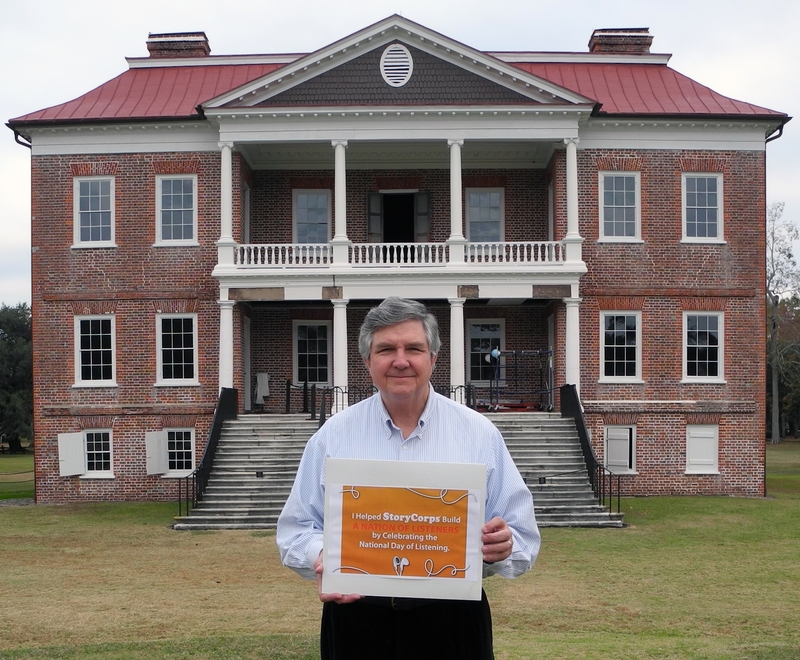 Drayton Hall was proud to support the National Day of Listening! Haven’t heard about it yet? Head on over to Story Corps’ website to check it out and get in the know by clicking here. Our Executive Director, George McDaniel, has been a proponent of oral history for a long time- he loves getting out of the office and sitting down with people near and far to hear their story. We sat down with him for a cup of coffee yesterday and asked him some questions and heard why he decided to participate. Q: Hi George! Thanks for taking the time to sit down and talk about Story Corps, and why you feel so strongly about recording oral histories. If you don’t mind sharing, can you tell us what you decided to record for the National Day of Listening? A: Of course I’ll share. I decided to sit down and really tell the story of my experiences in Vietnam from 1969 and 1970. I hadn’t ever taken the time to write down any of those experiences, and I wanted to record them for my sake, my kid’s sake, and for posterity. I only have a few pictures of my time there and I was beginning to worry that the story would be lost if I didn’t record it. Q: Why is it important that these stories be recorded? Couldn’t you just email them to your kids or write them down somewhere? A: You could do that- from my perspective it isn’t really important how you record them but that you record them at all. But when you record something, hearing that person’s voice really gives you a sense of the person themselves- oral histories have a power to them because of that. You get a fuller picture of that person, you hear their own pacing. It’s also an easier process- recording something in this way allows the story to flow more freely than trying to write it down, and it comes out more naturally. Just sitting down to answer these questions is a whole lot easier than writing down my thoughts on paper. Q: You’ve done so many oral histories over your long career. Are there any seminal moments you’ve had that really stick out when someone was telling you a story? A: Although there are many, I’d say the best involve Richmond Bowens (for new readers, click here to learn more about Mr. Bowens). One day we were out doing an excavation of his home site on the property, the actual site where he was raised as a child. According to the 1910 census report, there were 11 people living in the house at the site where we were digging. It said that the house was headed by his grandmother and that there were aunts, uncles, and cousins living there. During the excavations of the yard, the archaeologists had found very little debris or any remnants of material culture from the site- the most basic explanation and interpretation for this would have been that this large family lived in abject poverty. But Richmond was there and was able to tell us that the census taker had been mistaken- it was only he , his mother and father that lived in the house there. Furthermore, his mother was a stickler for cleanliness. At least once a day the yard was swept clean and their house was always neat as a pin. My other really special memory from that day was when we found a piece of a cut glass bowl during the dig. Richmond immediately recognized it as one of their nicer pieces that had held candies and goodies at Christmastime. This example shows how oral histories really give history a human dimension, and tell a more complete story. Q: In this fast paced high-tech world, how important are efforts like Story Corps? A: So important. They’re documenting the variety of the American experience by heading to different regions and getting a really good demographic cross-section. It’s also important because it prompts people to tell their stories to family members and others after they record it. After I did my recording, I was inspired to tell friends and family who I’ve never opened up to before about my time in Vietnam. In this way, Story Corps serves as a catalyst to get people talking. It creates storytellers who tell their experience to people. Then those listeners are prompted to become storytellers as well and tell their stories. It serves a great purpose. Q: How important have oral histories been in interpreting Drayton Hall? A: Oral histories have enabled us to record the history of this site from a variety of perspectives. We’ve talked to so many members of the Drayton family and the enslaved families that lived and worked on this site. We are also talking about starting to do oral histories of longtime staff members like Bob Barker who worked here from the first year the site opened to the public and just recently retired. We’re getting to a point where we need to start thinking about the history of the site and the history of the organization that runs it. One of the more powerful oral histories that we have from the Draytons is Charlie Drayton’s reflection on deciding to sell Drayton Hall to the National Trust after seven generations of ownership. (To see parts of the clip, click here. Fair warning: have a tissue handy) We also spoke to his daughter Anne Drayton Nelson about that decision, and she reflected on her Dad’s decision, calling it the courageous, right thing to do. Oral histories are powerful stuff. George, thanks for sitting down with us, and thank you for preserving so much history for future generations!